Iaito Musashi Bushido Katana Sword | BUDK.com - Knives & Swords At The Lowest Prices! 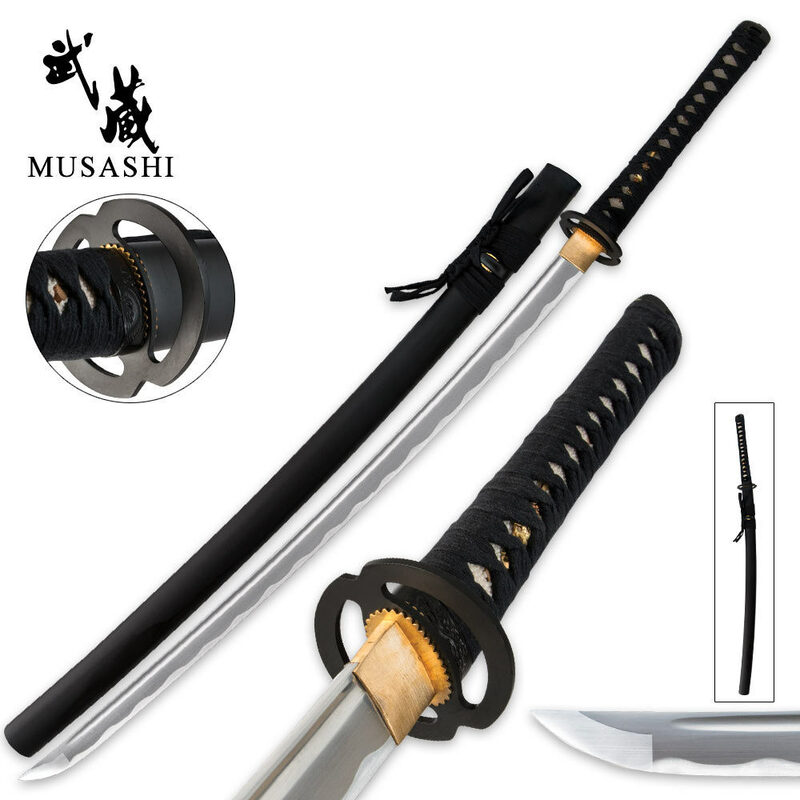 The Iaito Musashi Bushido Katana Sword is designed for training and practice. With the same look and feel of the sharpened, battle ready swords, this sword features a 1045 high carbon steel, full-tang blade without the sharp edge. The dual bamboo peg construction allows you to take apart your sword for care. The hardwood handle offers genuine ray skin with tight cord wrappings. Includes the traditional tsuba and fittings of a battle ready sword as well as a sword bag. It is a great sword Love it once I got it, Although I was wondering if 41' was a normal Katana length, although it isn't the normal 60', I'm still happy with it, reason being is it fits me well. And I recommend anyone this Katana for any usage (No not for cutting ._.). This was my first ever purchase from TrueSwords as well as my first Musashi product ever. I have had it for almost a week now and it is amazing for kata practice. The blade sings beautifully when I get the cuts right. Ito is wrapped very tightly and nothing rattles. Saya and blade fit extremely well. Highly recommend!!! This product arrived poorly packaged. The sword itself is ok but the saya poorly fits and the sword rattles within it. The black finish on the saya looks cheap and part of the saya was cracked with a piece falling off. If you are determined to buy a sword I got a sharpened mushahi 1060 carbon sword which was better quality for $100. This sword was a disappointment. I just received this a few days ago and I am very pleased with it. The Musashi Bushido line has been known, for the most part, to deliver quality swords at extremely low cost, and this item is no different. The shipping took about a week, and there were no dents, dings or scratches to the product when I received it. The wooden saya is a matte black and the sword fits into it perfectly. The fittings are tight, leaving the sword with no undesirable rattling. The sageo and ito are of cotton. The fuchi, kashira, and menuki seem to be of cheaper materials, but the tsuba is solid. The same is in panels instead of a wrap, but it still allows for a tight tsuka-ito. The point of balance is a bit higher than normal leaving the sword more blade heavy than what is traditional, but nothing bad enough to make it unwieldy. In my personal opinion, this iaito would serve any student of iai who wishes to have the feel of a shinken quite well. I just got a pair of these swords today, and instantly fell in love with them. I wanted some swords meant for taking and dealing some damage. The instant I held them, I knew I made the right choice in buying them. I did and do read the reviews of every item I'd like to purchase from here. Most reviews said nothing but good things about this item, so I was compelled to purchase it. These are my first battle ready swords, and the heaviness I felt from holding them made me think of the first sword I owned. It was very nostalgic, which made me love these swords even more. My first swords are much lighter, so it feels like I'm starting over again. I can't wait to start training with these. Thank you, TrueSwords, and a special thanks to Geraldine who packaged them. I got this sword and it is pretty darn awesome! I love it because when it is raining outside I can swing this one in the house instead of my sharpened katana I got from this website which would be way too dangerous. This katana is very awesome and I recommend it to anyone who has to have a real practice katana for inside practice or for inside kata practice or for non deadly self defense. Purchased this iaito several months back. It's held up really well, it's perfect for kata practice. Few really minor imperfections; the dye on the ito has rubbed off a bit so it's kind of a grayish color and not the black it was when I first unpacked it, one of the menuki is placed down by the kashira, and the same is wrinkled so it sometimes scrapes my palm but otherwise it's a fantastic training tool, especially considering the price. Got my eye on the wakizashi iaito next! The sword is beautiful and well balanced. My only qualm is that fhe cotton storage bag has a must smell to it and it seems to have imparted that to the scabbard and cotton wrap on said scabbard. Other than that, I am very pleased with the speed of the service quality of the blade. I will be purchasing more swords from True Swords. Fast service and delivery. Exceptionally well made. Great weight and balance, looking forward to practicing with it.